High performance Comar 9P.i Rebated doors offer exceptionally low U-values, security and weather performance. To comply with the latest regulations and Comar 9P.i has options for low-rise thresholds. Comar 9P.i rebated open-in and open out, single or double door-sets with a range of drained thresholds for compliance with Lifetime Homes and other access regulations. The high security option that has passed the requirements of PAS 23 and Pas 24. 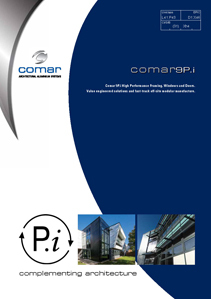 Building typologies differ from refurbishment to new build, so Comar 9P.i has profile widths of 80mm, 100mm or 120mm creating greater design flexibility. There are two levels of thermal performance: Standard and Enhanced P.i, creating U-values of between 1.6 to 1.0 for a typical grid size with opening vents. Comar 9P.i has slim 65mm sightlines to ensure that architecturally demanded aesthetics are achieved. Glazing lines are flush, maintaining consistent lines for a sleek external facade providing straight interfacing with walls, internal floors and partitions. Consideration is also given for plaster lines with profiles to cater for differing situations. Single and double doors, open-in or open-out can be hung directly from Comar 9P.i framing systems with no need for additional door stiles creating a value engineered solution. Comar 9P.i doors can also be installed as standard door sets.